You read all of these blogs about other amazing HLHS kids, you read their stories and get involved in their progress and secretly you say my HLHS'er will do better than that. My HLHS'er will beat all the odds and not go through all of those forward and backward steps. We probably haven't gotten to the lowest point yet, but my optimism and high hopes for being the miracle baby are a little disheveled at the moment. Seeing her paralyzed again, and re-intubated (even though we were warned) is heart breaking. I know she needed it, she can't spend her recovery with her sats in the 70's. I made the mistake of looking at this picture yesterday to the right. After several days sleeping in the hospital getting little to no sleep Melanie and I crashed. Yesterday we had to get out of the hospital and we spent the night at the ronald mcdonald house. We called a few times and she has been comfortable all night. I am already missing this sweet little smile. She didn't open her eyes yesterday at all. I'll get the good news out of the way first, we booked flights for the kids to come up Nov 23 to Nov 29 for Thanksgiving. I'm imagining brighter Olivia days by then, maybe even being discharged. Even when I'm down I never lose my optimistim, but it was tough. Firstly, she is burning through Calcium like it is nothing. Her blood gases (they take every hour to make sure she is getting enough oxygen and other nutrients) show a low Calcium all the time. As a result, they tested her parathyroid and it came back very elevated. She has some hypocalcimia problem. They are seeing if it is genetic but the amnio melanie had said it was negative. This test will take a few weeks. This is the completely out in left field problem Olivia is having, not typical to HLHS'ers at all. Dr. Spray told us she is going to get over all of this, she just has to get past the lung disease. He feels the Sano shunt is fine and there is no clotting over it. Olivia continues to have haziness in her chest x-rays but her lungs haven't collapsed yet. She is on some serious antibiotics and will hopefully get rid of any infection she is seeing right now. 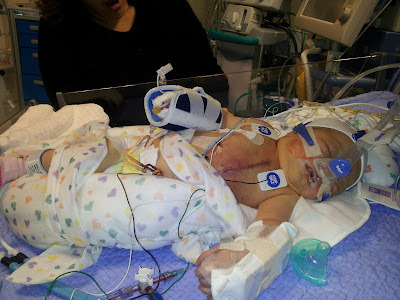 Last night they began the process of weaning her ventilator settings so she can be extubated again today at some point. Now we are rushing to get out of here so we can make rounds and hear what the plan is today. Yesterday Olivia didn't reach the goals they had for her, hopefully today she will. All the medical stuff I type is basically reguritated from Melanie or the doctors. Stuff will be mispelled or incorrectly explained. 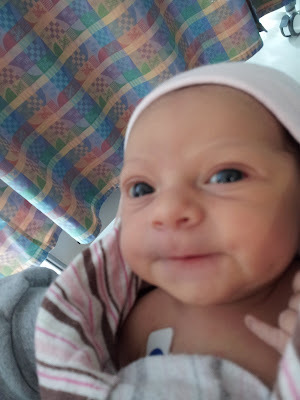 When this is all over and our blog is back to boring cute pictures of a sweet little princess I'll finally have my license to explain medical things lol. Even though it was short lived here is a picture of Olivia on the CPAP, with her dressing off of her incision. Yes she is turning a little yellow with her bilirubin's up to 12. We are expecting a billi light at her bedside when we get there. If so, we'll post a cute picture of her sunbathing. Just like Nathan and Delilah did with their cases of jaundice. Jaundice is a cakewalk. Thanks for reading my dissertations. I'll update more today, i promise. Continuous prayers are with you. Re-intubation is more common than you think...we have been through it a few times (two with the Norwood and one with the Glenn). I wish I were as positive as you all have been...we had little encouragement at the first hospital and it came with us when we transferred Hope. She was in the hospital for six weeks with her Norwood and I thought she did amazing...better than I expected. Now I have a typical two year old running around talking and laughing and throwing temper tantrums. Her brothers love on her and fight with her and I am amazed every single day. Many prayers are being said in Ohio for your whole family. Thanks for the update! We've been thinking and praying for you and yours. I'll also throw in some prayers for peace on the roller coaster! "She had a good night." I always could breathe after I heard that report from the nurse. It sounds like she's ready for some serious recovery and recouperation. Continued thoughts, prayers and positive energy. You and Mel are doing great - give Mel a hug and let her know it's from all of us heart mommas. I'll see if I can find any HLHSer with hypocalcemia issues - you got me on that one :) Keep your chin up and keep on fighting!